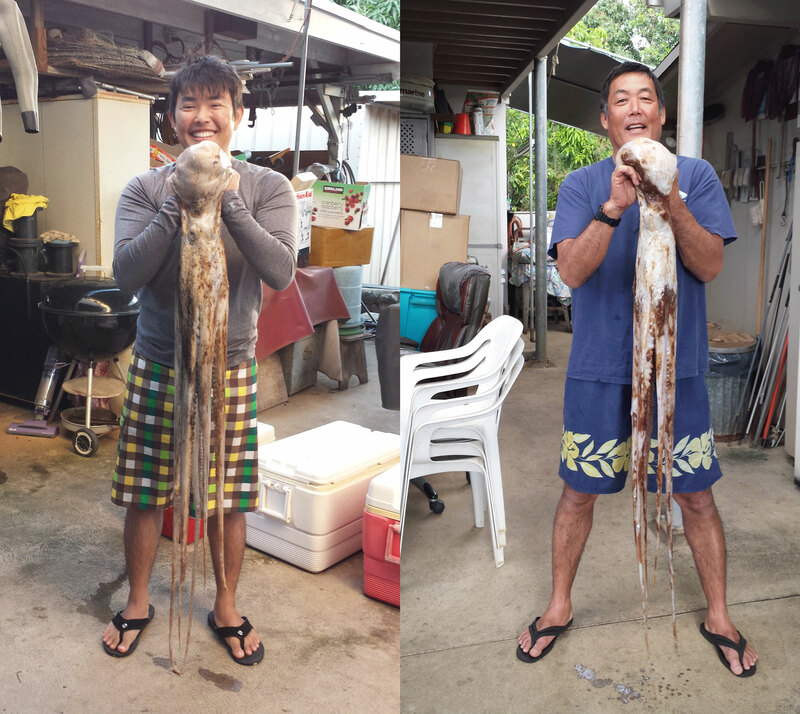 Son and father, Dane Inouye and Ricky Inouye, catching squid in Hawaii. Photos courtesy of Michele Inouye. Many local residents in Hawaii love to eat octopus. But a few also enjoy the fine, but often unappreciated, art of catching them. Even though an octopus is not really a squid or calamari, most people in Hawaii confusingly refer to an octopus as a squid. As a result, some residents refer to the act of catching octopus in Hawaii as “squidding.” While the Hawaiian word for octopus is he’e, many Hawaii residents also call it tako, the Japanese word for octopus. We’ll tell you more about the art of catching squid in Hawaii here. And better yet, we’ll tell you how to prepare and eat them in a very delicious way. Catching tako is a true art form. You can catch tako during the day or night. At such times you will be correspondingly going after either day tako or night tako. Day tako is shorter, but thicker and is brown in color. Night tako is longer, but thinner and is typically red with white spots. Both takos like to hide in holes in the reefs. But they come out to feed either during the day or night depending upon what type of tako they are. Most say that both taste the same. However, the night tako is tougher in texture. Day tako is typically caught by diving with a spear. Night tako is also caught by spear. But it’s usually done through what locals refer to as torching. This entails walking on the reefs at night, using a lantern or bright light to spot potential prey. The key to spearing day tako or night tako is to possess what locals refer to as the “squid eye.” This is a reference to the acquired knack to spotting the tako. Tako is difficult to spot because, as it can change the color of its skin, it has excellent camouflage capabilities. And it’s not a matter of simply spearing the tako in their holes. You have to have a sense of what a tako hole looks like and you cannot just simply jam your spear into the tako. Just jamming the spear into the tako will make the tako use its powerful suction-cupped tentacles to hold onto the hole even more tightly. This makes it virtually impossible to pull it out of the hole. Instead, you have nudge your spear into the tako to coax it to use its tentacles to crawl up the spear. After you do that, then you can pull your spear out of the hole, with the tako hanging onto it. And then you can put it into a bag. The next is to prepare the tako for eating. First, you have to clean the tako by turning the head inside out to take out the guts. Then you vigorously massage the tako with table salt. This softens the tako as well as removes the slime from it. Rinse with water and repeat the process until you remove all of the slime. If you like the tako to be even softer, you can even freeze it for a couple of days before you clean and massage it with salt.